Moderate moisture. Woods. Full to partial sun. This is a 12″ to 28″ tall, erect, perennial forb that produces multiple flowering stems from a stout rhizome. The stems are green and up to 24″ tall. The stems, basal leaf stalks, stem leaf stalks, and flower stalks all have coarse, white, non-glandular (not sticky) hairs. 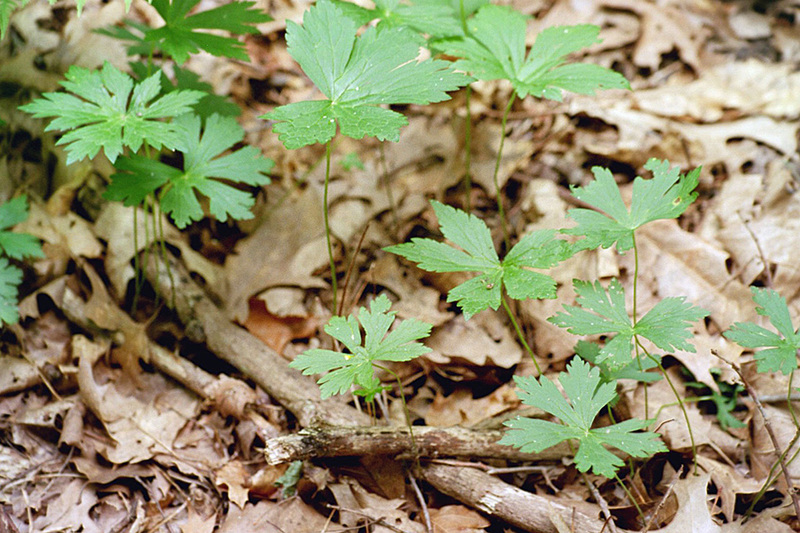 A few basal leaves rise from the underground rhizome on long, up to 12″, leaf stalks. They are palmately divided into 5 to 7 irregular, deep, wedge-shaped lobes. The lobes are not toothed, notched, or divided in the basal half, but are coarsely toothed and often have secondary lobes in the upper half. The upper surface of the leaves has fine white hairs. 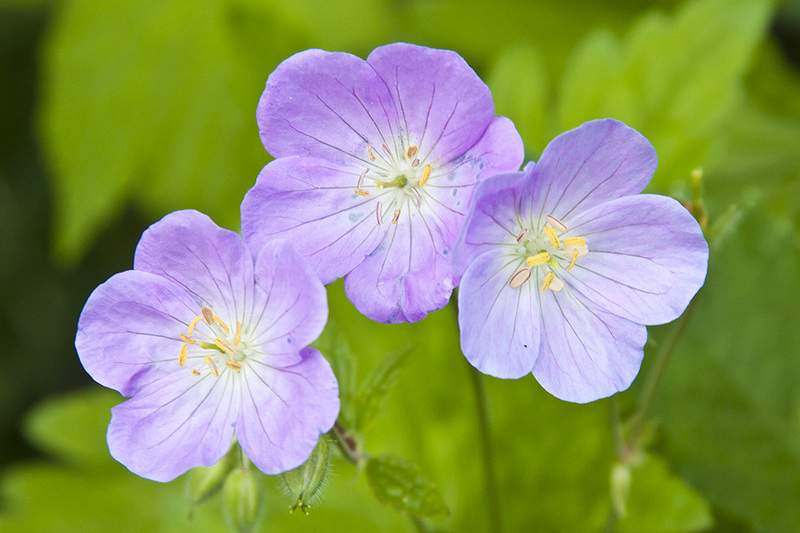 Older leaves sometimes have white spots, which gives this plant one of its common names, Spotted Geranium. There is only a single pair of leaves on the stem. They are opposite and similar in appearance and features to the basal leaves, but are smaller and usually have only 3 lobes. They are on short leaf stalks. The inflorescence is a flat or round topped cluster of 1 to 6 flowers at the end of a long stalk. 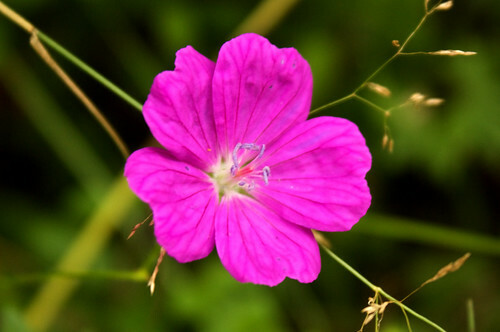 The flowers are 1″ to 1½″ wide with 5 petals and 5 green sepals. 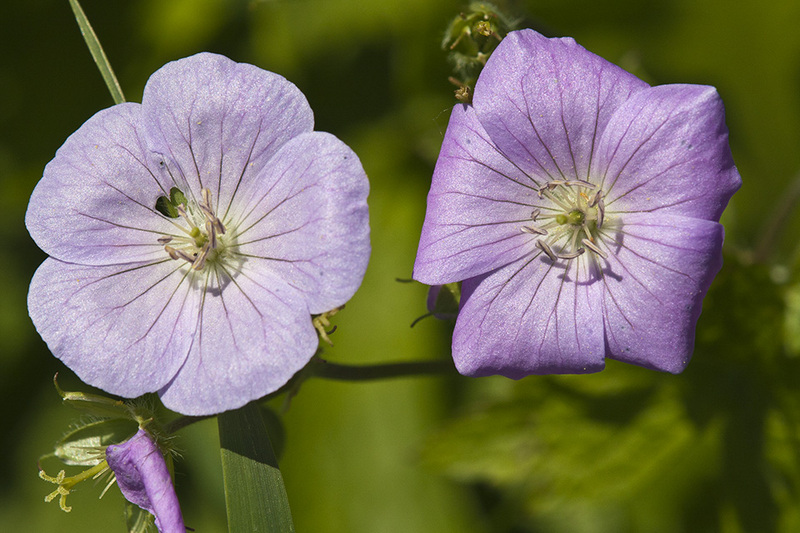 The petals are rose-purple, pale purple, violet-purple or, rarely, white, with darker fine lines radiating from the center of the flower and acting as nectar guides. 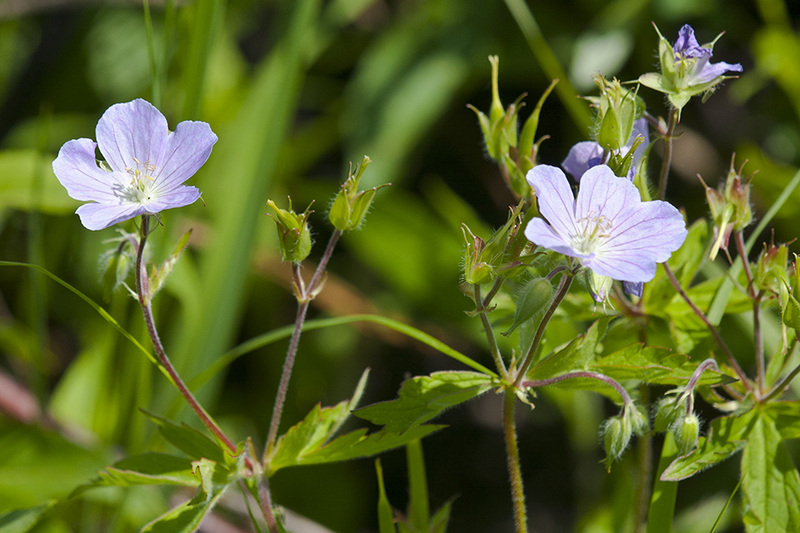 The fruit is a 1″ to 1½″ long, erect capsule in the shape of a crane’s bill, giving this plant another of its common names, Wild Crane’s-bill. Bicknell’s Cranesbill (Geranium bicknellii) has leafy stems and no basal leaves. The inflorescence is a 2-flowered cluster. 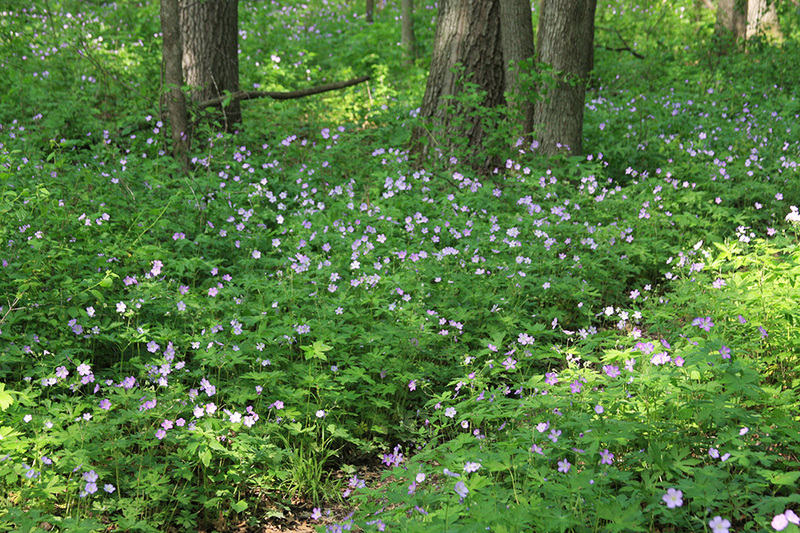 The flowers are only ⅓″ to ½″ wide. The flower petals are notched at the tip. 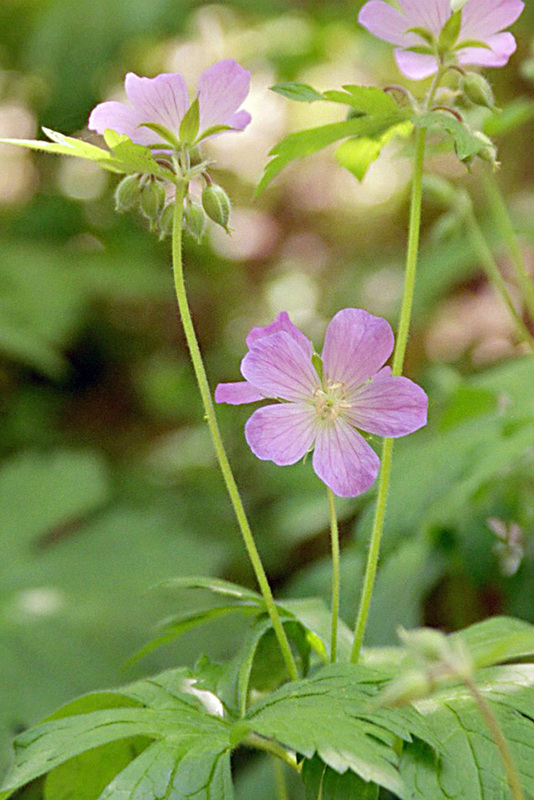 Carolina geranium (Geranium carolinianum) has leafy stems and no basal leaves. The leaves are divided into usually 5 to 9 deeply-cut lobes. The leaf margins have widely spaced, deeply-cut teeth, that may amount to secondary lobes. The inflorescence is a tight cluster of many flowers. 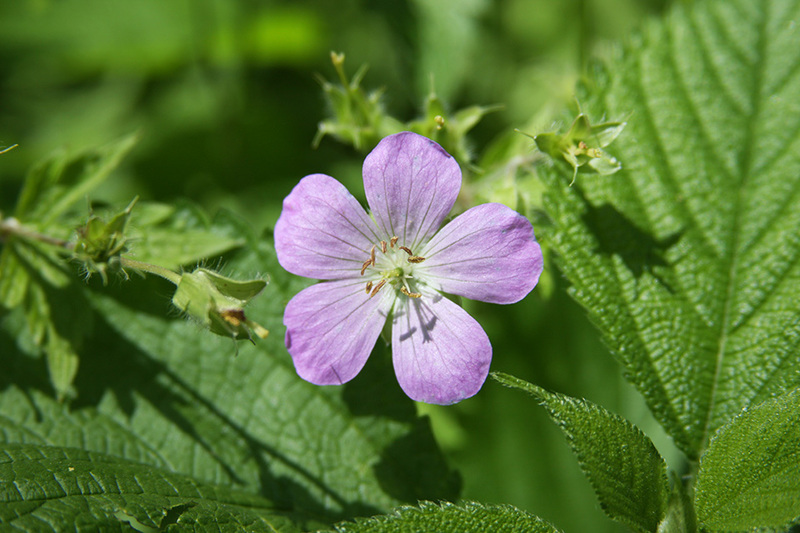 The flowers are on short flower stalks that are less than half as long as the sepals. 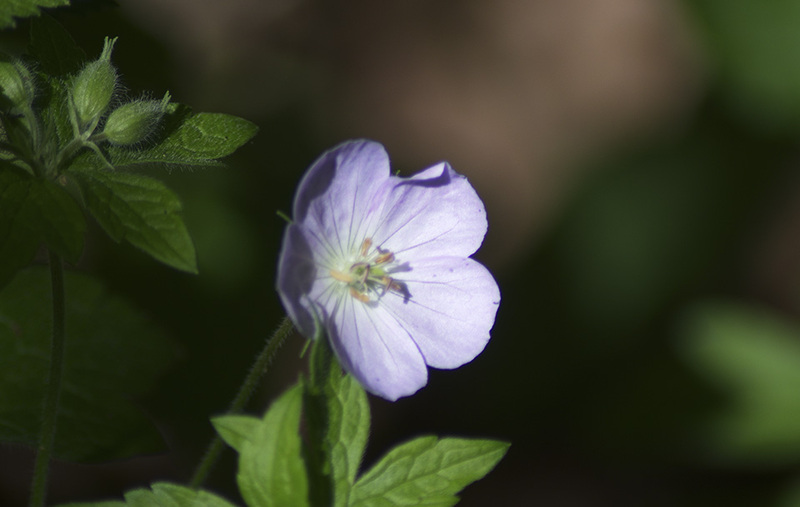 The flowers are dull white to light pink and only ⅓″ wide. Meadow geranium (Geranium pratense), an introduced species, has glandular, sticky hairs on the flowering stalks and leaf stalks. The leaves are more finely cut. 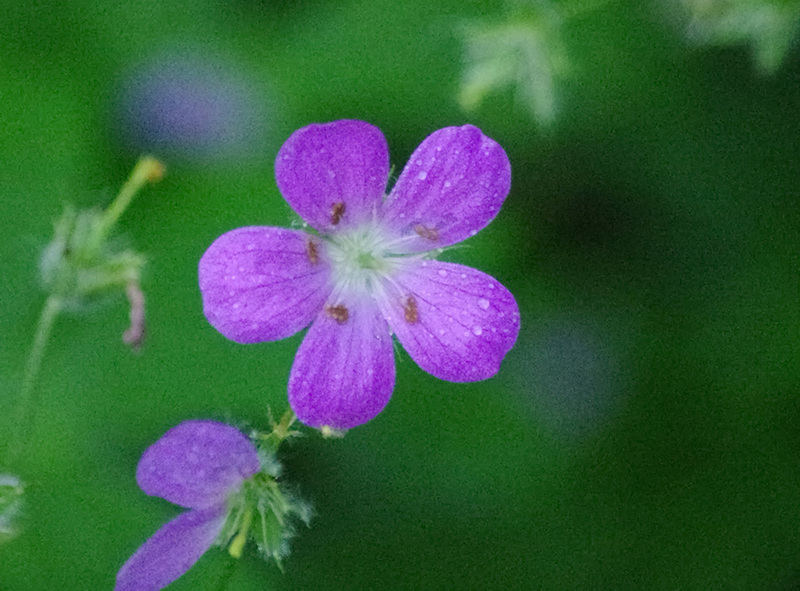 The petals are not marked with darker lines. It has been recorded only in St. Louis County. 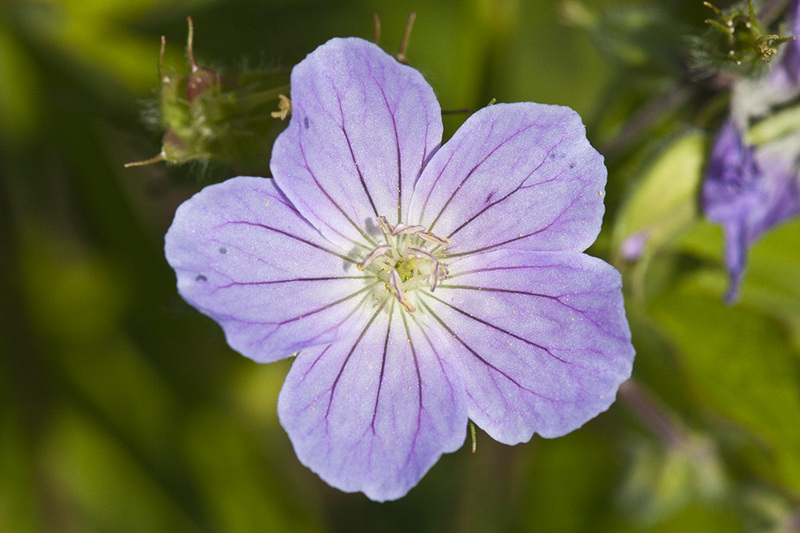 Robert’s geranium (Geranium robertianum) has leafy stems and no basal leaves. The leaves are divided into usually 3 to 5 leaflets that are cut all the way to the base, with at least the terminal leaflet on an evident leaflet stalk. The leaflets are fern-like. The inflorescence is a 2-flowered cluster from the upper leaf axils. It has been recorded only in St. Louis County. 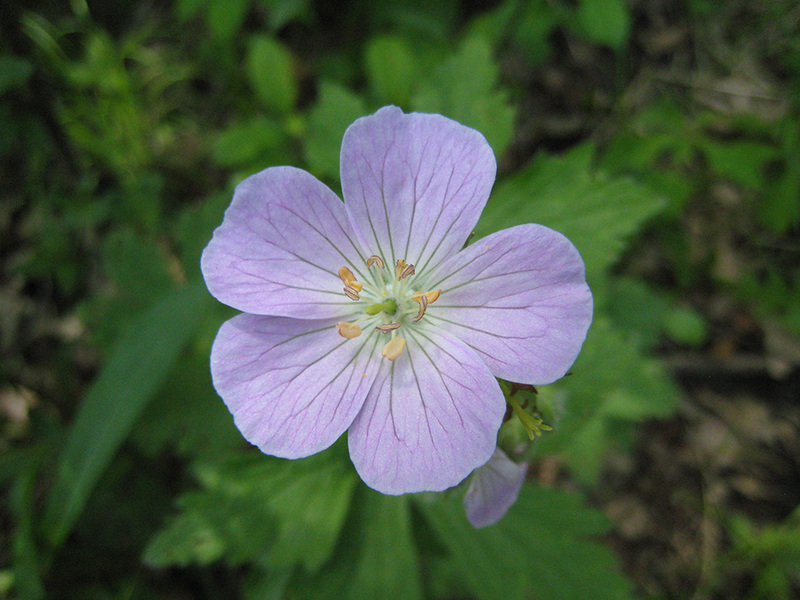 Siberian cranesbill (Geranium sibiricum) has leafy stems and no basal leaves. The flowers occur singly or in pairs. It has been recorded only in Houston and Goodhue Counties. 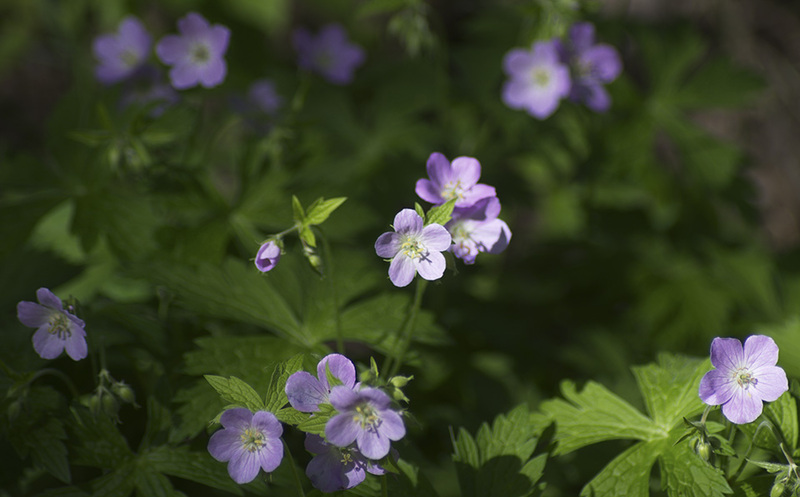 When not in flower wild geranium can be easily mistaken for Canada anemone (Anemone canadensis).